#1. We train llamas here. Oh Yes We Do. The Llama Rendezvous and Drive-In took place here in the park. 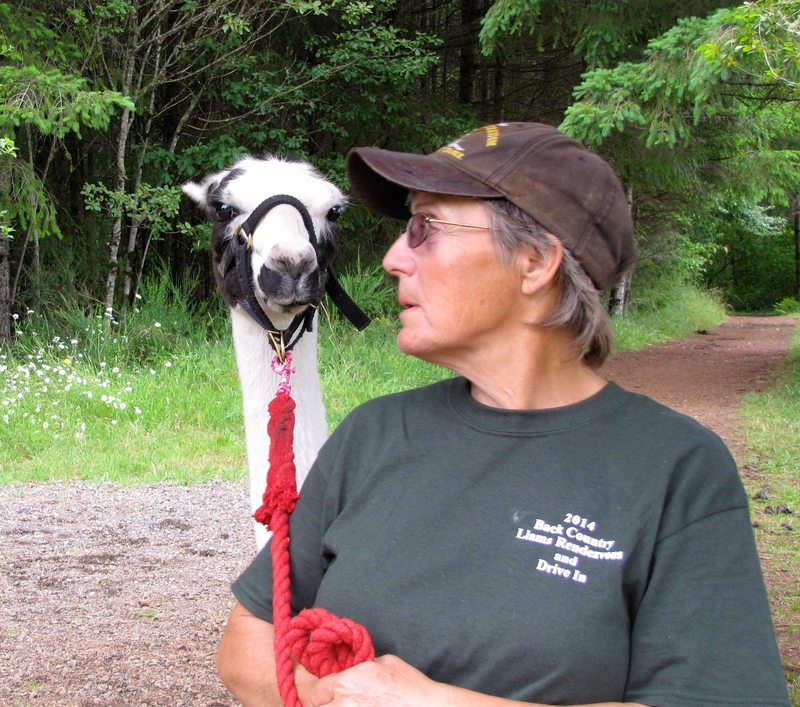 Every year the Back Country Llama Association – a group specifically dedicated to llama packing – and Rattlesnake Ridge Ranch, a breeding ranch specializing in pack llamas and llama rescue, sponsor a gathering of working llamas. 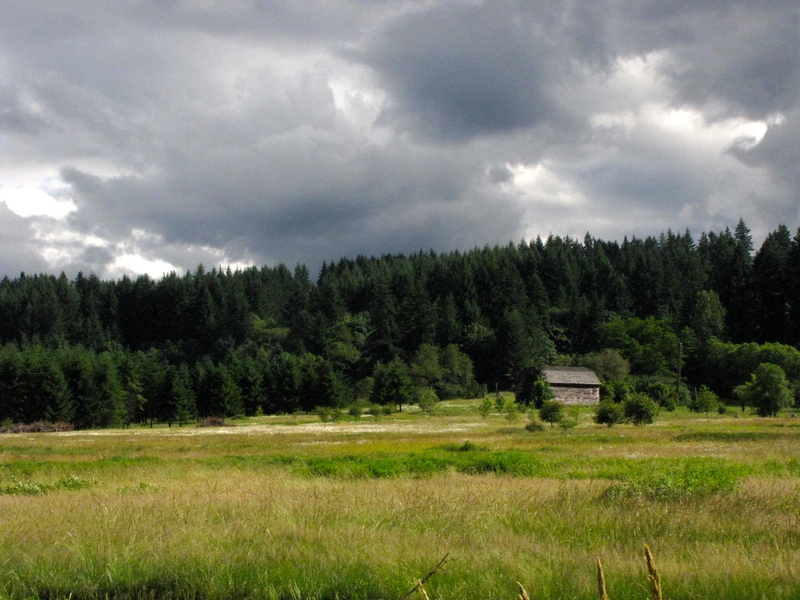 This year the event was hosted by Hidden Oaks Llama Ranch in Estacada, Oregon. Pack llamas, cart llamas and working llamas of all types gathered with their handlers to learn together and educate others and have fun. How can you NOT have fun with dozens of Llamas in the house (or park in this case…). These llamas don’t just hang out and look pretty – these suckers work. They were here today to go through their paces – endurance, stamina, skills – tested during field trials staged in a realistic packing environment. Extreme – the Derek Jeters (athletes) of the llama world. The llamas and their human companions were here going through the trials and getting practice on the horse obsticle course. Once the trials were finished, they had a llama happy hour in the field surrounding the horse course. I wish I had one of these suckers on grocery day. And trips back from wineries. #2. Lake Estacada is overshadowed by a dam that resembles a Stephen King Prison. There’s a spot in the park, above where the wacky kayakers paddle, and it’s beautiful and dangerous-looking like a certain notorious jail. There’s wildlife, there’s sunshine, there’s a bit of a current – but nothing you can’t swim against once you get downstream. And then there’s this huge dam. It’s industrial, and towering, and ominous . How does it connect to the raging water below? You feel like you’re on a sound stage, or standing at the base of a hard-to-escape insane asylum. Walking up to it from the river, you pass these small water-carved pools full of churning pine needles – why? Unreal things happen here, like steelhead the size of my thigh (and let me promise you, that’s huge!) jumping straight out of the water. It’s weird and quiet, apart from the rush of the water – or a random yelp from fish-catching excitement. It’s nature and industry all balled up together in one wartime package. Milo McIver is home to one of the few nursery colonies in the state for a special type of bat – the rare Townsend’s big-eared bat, which looks as amusing as it sounds. It’s listed as a sensitive species in Oregon. Park staff discovered the bats living at Milo McIver about 15 years ago. Each summer, female big-eared bats gather to roost in a weathered horse barn that was once part of an old homestead— fruit and nut trees still grow in the surrounding meadow. PS – we are hoping those fruits and nuts are growing while we are here! Today, the meadow and the barn are a home for six different types of bats, including the little brown bat and the big brown bat. Bats aren’t able to bore holes in wood or make nests, so they find tree branches, caves or man-made structures where they can roost. A barn is an ideal place for bats to raise their young because it stays warm and dry throughout the rainy winter. As many as 70-80 bats have lived in the barn during the summers. The park’s bat housing options expanded when Eagle Scouts built eight bat houses on posts for the animals. Don & I are in charge of counting bats. Wish us luck! 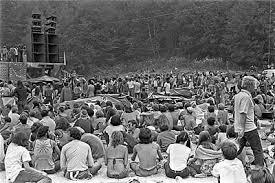 Summer of 1970, tens of thousands of people converged at Milo Macin for “Vortex 1”. This “biodegradable festival of life” celebrated freedom — freedom from violence, from drug laws and from clothes. It also served as an elaborate ploy to lure young people away from Portland. And to this day, Vortex remains America’s only large-scale rock festival ever sponsored by a Republican (yes – you read that right!) governor. Sure he would not have been welcomed by the Tea Party today. Oh No! Summer, 1970. Richard Nixon was president and the Vietnam War raged on. The preceding months had seen the shooting of war protesters at Kent State University and the beating of demonstrators in Portland. Now anti-war activists were planning to converge on Portland during an American Legion convention. The FBI was forecasting 50,000 people and a violent outcome. Vortex I is the only state-sponsored rock festival in U.S. history. It was a diversion to lure young people away from planned — and potentially violent — anti-war protests at an American Legion convention in Portland. And it succeeded. The festival took place at Milo McIver. Some now-unknown person created the name “Vortex I: A Biodegradable Festival of Life,” and it stuck. And many people came. Estimates range from 30,000 to 100,000. PS – The Park is hosting a Vortex Anniversary Celebration August 9 -with live music and tie-die for adults. Really! One Example? The Indian Pipe – aka ghost or corpse plant- which is a lazy little thing. It doesn’t make its own food like most other plants and gets its food from other organisms. Indian Pipe has zero chlorophyll necessary for photosynthesis to make it’s own food with sunligh – with no need for true leaves with are replaced with small scales on the stem. One of the few plants that able to live in the darkest areas of the forest. Welcome to Milo! The roots of the Indianpipe connect with the underground elements of a fungus. It does not stop there – that fungus needs to have other mycelia attached to the roots of a tree. The fungus provides the tree with certain minerals it has absorbed from the soil. The tree supplies sugars to the fungus. A whole circle of life thing going on. Fungus has absorbed some sugar from the tree, the Indianpipe rips off sugar from the fungus. What does the fungus and/or the tree get from the Indianpipe? Zippy. MIlo Mac has these – and other rare plants – on its numerouse hiking & horse trails. #5+ Bonus Weird Thing: It has the best Kayak Program in the Oregon State Park System! Led by Ranger Andrew Brainard and his two slacking assistants, the Park offers kayak tours every Monday, Thursday & Sunday (early morning on Sunday, so no parties Saturday Night). Ranger Brainard takes his yakers on a two-hour tour of Estacada Lake, showing the highlights of the lake and discussing local history as well as flora & fauna. Due to the success of the 2013 program, the park expanded the 2014 kayak tours offered to the public to three per week – maybe more, depending on demand. Come in costume for a extra-special experience! (joking here). Come Experience the Weird and Not-Weird at Milo Mac!